Sometimes simplicity is striking. Backdrop scenery and unique lighting techniques are always interesting, but for this classic black and white portrait of the bride and groom, we eliminated all distracting elements and focused solely on the couple. 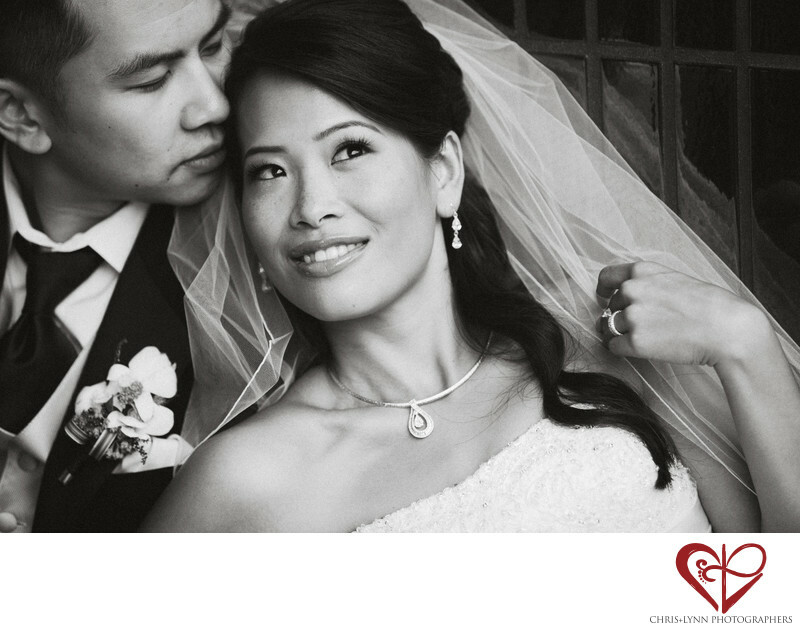 This type of natural wedding portrait keeps the attention on the bride’s beauty and the groom’s connection to her. On the wedding day, we always find opportunities to shoot portraits in soft diffused light - ideal for closeups as it minimizes imperfections, reduces harsh shadows, and smooths skin. To create even more flattering conditions for this image, we used a reflector to bounce light back onto the face, adding sparkling catchlights to the bride's eyes. The close crop highlights the bride's face, and the placement of the veil and angle of her head create a stable triangular composition again leading to the main focal point of the image - the bride's expression and her eyes. In terms of posing, every couple is different. Every once in a while, we will have a couple who wants all their photos to be candid with no interaction from the photographers. However the majority of couples do like to have some guidance from us during their portrait session. After all, if professional models need instruction and feedback from their photographer, art director, and production team during a shoot, all of us can probably benefit from a little direction.